1. Italian soldier; born at Leghorn in 1851. He studied at the military academy of his native town, and was appointed lieutenant in the engineer corps at the age of twenty. Subsequently assigned to the sharpshooters, he was transferred to the staff and attached to the military section of the Geographical Institute at Florence. On his promotion to a captaincy he was appointed adjutant to General Heusch. In 1895, with the rank of major, he was sent, under General Baldissera, to join the army then operating in Africa. A few days before his arrival, however, the Italian commander, Baratieri, had provoked and lost the battle of Adowa. After the campaign Coen, promoted to the rank of lieutenant-colonel, was appointed director of the military section of the Geographical Institute. He has since been transferred to Cesena as commander of the Second Regiment of the Royal Brigade.Coen is a knight of the Order of the Crown of Italy, and of the Order of Saint Maurice and Saint Lazarus. He has published numerous essays in technical journals and in the "Nuova Antologia," and also reports of work done at the Geographical Institute, notably "Venticinque Anni di Lavoro all'Istituto Geografico." 2. Italian historian; born at Pisa Jan. 5, 1844. At the age of twenty-three he was appointed professor of history at the Lyceum of Leghorn. In 1879 he was called as professor of ancient history to the Accademia Scientifica e Letteraria at Milan, and in 1887, in the same capacity, to the Istituto di Studi Superiori at Florence, taking charge also of the university library of that city. 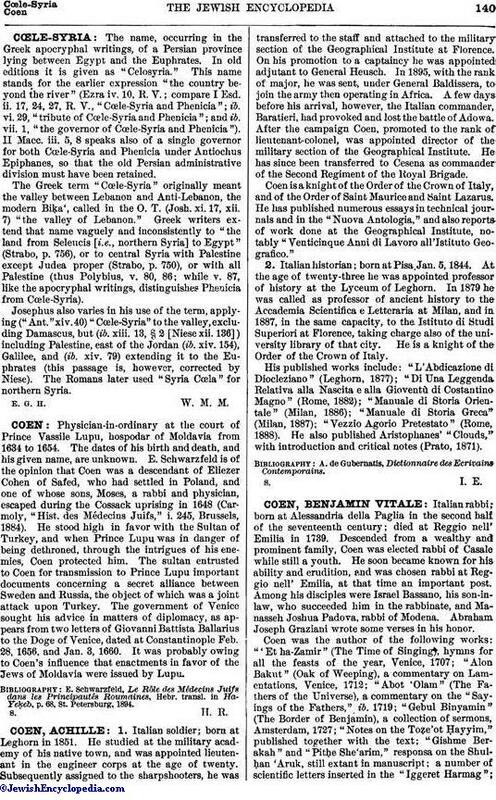 He is a knight of the Order of the Crown of Italy.His published works include: "L'Abdicazione di Diocleziano" (Leghorn, 1877); "Di Una Leggenda Relativa alla Nascita e alla Gioventù di Costantino Magno" (Rome, 1882); "Manuale di Storia Orientale" (Milan, 1886); "Manuale di Storia Greca" (Milan, 1887); "Vezzio Agorio Pretestato" (Rome, 1888). He also published Aristophanes' "Clouds," with introduction and critical notes (Prato, 1871). A. de Gubernatis, Dictionnaire des Ecrivains Contemporains.